Given the unprecedented amount of rains that flooded the lowcountry at the beginning of October, you might have thought fishing would have been off for quite some time. We were very pleasantly surprised that fishing had returned to its usual Fall self quickly. Anglers can expect an excellent November with hungry fish eating aggressively in advance of the Winter. As water temperatures decline, redfish have begun their annual phenomenon of forming large schools. Schools of fifty redfish are common and the numbers will reach 100-150 in some cases in the depths of Winter. These fish do become a little more wary this time of year and artificial lures can spook them. Instead of chasing the schools, we have been setting out as many as three lines with chunks of blue crab on #3/0 circle hooks. The redfish will smell this bait in the water and usually in short order our rods are bending over with some ferocious hits. The water is teeming with shrimp – trout simply cannot get enough of them. Lots of little smaller fish can’t get enough of shrimp either. When these bait stealers run rampant, I switch over to DOA 3″ artificial shrimp which I find most effective when fished underneath a popping cork. I like the glow/gold and nite glow colors which look like real shrimp in the water. When fishing a popping cork, it is important to make sure that you reel in any slack line on the water so you are ready when a fish hits. With the most recent set of high tides two weeks ago, we probably witnessed the last true tailing tides of the year. 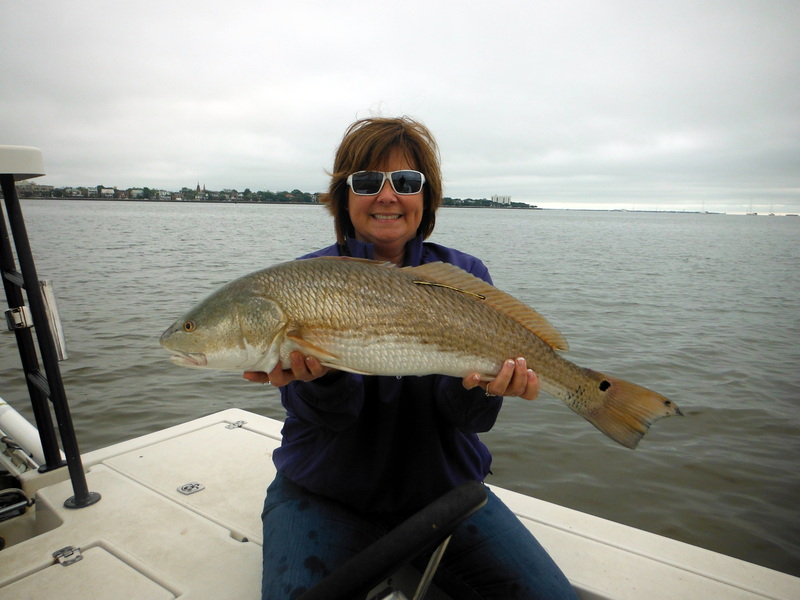 Fly fishermen should turn their attention to chasing the large schools of redfish on the flats. Late morning or midday low tides will be key as the flats will warm up a few degrees and make for active fish. Darker flies are working best although don’t be afraid to throw some copper flies with lots of flash.